Marc Glidden, ABD is a Visiting Assistant Professor in the Department of Criminal Justice at the University of Arkansas at Little Rock. 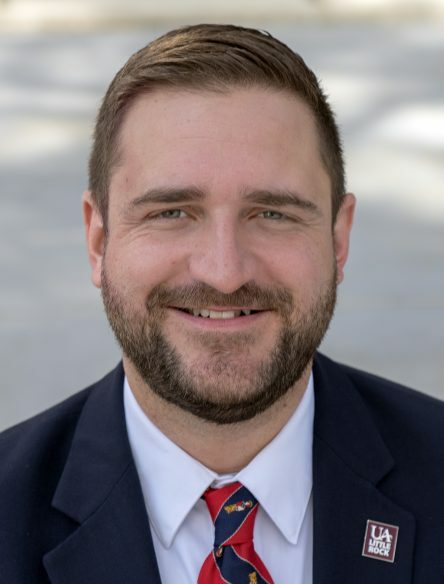 He joined the faculty in the fall semester of 2018 after receiving his M.A. in Education from McKendree University (2013) and his B.S. in Criminal Justice from East Carolina University (2010). He is also a doctoral candidate within the Department of Criminal Justice and intends to complete his Ph.D. in Criminal Justice by defending his dissertation by May 2019. Marc’s dissertation examines the interplay between crime and financial institution access. More specifically, his dissertation utilizes an ecological theoretical framework to examine the intersection of banking deserts and criminal behavior within Arkansas; with emphasis on the impact of access to mainstream banking institutions on rates of criminal activity. Marc’s research interests include financial capability and access in relation to crime, corrections, re-entry, criminal justice education, and university/college campus crime. The majority of his research has been interdisciplinary, focusing on concepts from the fields of both criminal justice and economics. Most recently, he has collaborated with colleagues in the Department of Economics and the Department of Criminal Justice at UA-Little Rock on research highlighting the diminutive understanding of financial concepts among incarcerated individuals within Arkansas and the barriers this poses to inmates upon release to society. Marc has taught for the Department of Criminal Justice since fall of 2014 and adheres to a student-centered, high impact approach, which emphasizes active learning, critical thinking, and learning assessments. Prior to joining the faculty in the Department of Criminal Justice, Marc served as the Director of Campus Living and Assistant Dean of Students at the University of Arkansas at Little Rock. Marc enjoys working with college students and seeks to provide them with the building blocks they need to succeed not only within the classroom, but for their future careers. Please click here to view Marc Glidden’s vita.